JACKSONVILLE, Fla. - The Jacksonville Suns will raise money for victims of flooding in Louisiana during their homestand at the Baseball Grounds of Jacksonville Monday, Aug. 22, through Thursday. Aug. 25, while their fellow Miami Marlins affiliate, the Triple-A New Orleans Zephyrs, also raises money for relief efforts during their coinciding homestand. 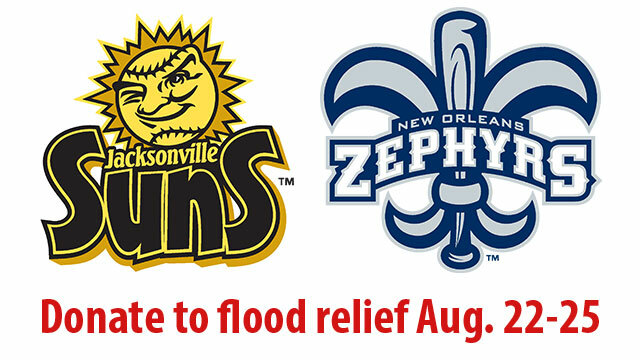 For each ticket sold on game days Monday through Thursday at the walk-up ticket windows at the Baseball Grounds of Jacksonville, the Suns will donate $1 to the American Red Cross Louisiana Floods Relief fund. Any additional donations made at the box office will also be donated. "We are grateful to partner with another member of our baseball family, the New Orleans Zephyrs, to make an impact for flood victims in Louisiana," said Suns General Manager Harold Craw. "We hope our guests at the ballpark next week and the entire Suns family will show these communities how much their neighbors in Northeast Florida care and support them." "Thanks to the New Orleans Zephyrs and American Red Cross, people in Jacksonville have an opportunity to make immediate impact hundreds of miles from the First Coast," said Suns Director of Community Relations Andrea Williams. "We are thankful that the Jacksonville Suns will be helping to raise much needed financial support for the Louisiana Floods Relief fund," said Zephyrs Senior Vice President and General Manager Cookie Rojas. "Their generosity is another example of how Minor League Baseball is a cornerstone for bringing communities together." The Red Cross is asking that instead of donating items, those who want to help should donate money so that their response can be activated more quickly and items needed can be bought in bulk. Preliminary estimates indicate that Red Cross response efforts could be the largest since Superstorm Sandy in 2012, and cost more than $10 million. Local officials are reporting that 10,000 homes have been damaged and more than 50 shelters have been opened to those who have been displaced by the flooding. The Suns face the Chattanooga Lookouts for five games beginning Monday, August 22 at 7:05 p.m. Tickets start at $5. For more information, contact the Suns at (904) 358-2846 or visit www.jaxsuns.com. ABOUT THE SUNS: The Jacksonville Suns are beginning a new era of affordable family fun under new ownership in 2016. With a FUNdamentally Different promotional schedule and a new lineup of ticket and group options for this season, there is a reason for everyone to get part of the action by calling the Suns at (904) 358-2846 or visiting www.jaxsuns.com.